Arup K. SenGupta, the P.C. Rossin Professor of Environmental Engineering at Lehigh University, was officially recognized as the 2014 Fellow of the National Academy of Inventors (NAI) on 20th March 2015 at the Beckman Auditorium of California Institute of Technology. The event was organized in concert with the United States Patent and Trademark Office (USPTO). Altogether 170 members were inducted as NAI fellows during the ceremony and of them, 73 were members of the National Academy and two, Shuji Nakamura and David Baltimore, were former Nobel Prize winners. Election to NAI Fellow status is a distinction “accorded to academic inventors who have demonstrated a prolific spirit of innovation in creating or facilitating outstanding inventions that have made a tangible impact on quality of life, economic development, and the welfare of society.” Over 180 universities in the US are affiliated with NAI. SenGupta was recognized for his invention and commercialization of the hybrid anion exchanger or HAIX-NanoFe for arsenic mitigation. Two US manufacturers, Layne Christensen Inc. and Purolite Co., produce HAIX-NanoFe sorbents and over two million pounds of the material are currently in use in six countries including the US providing arsenic-safe water to more than one million people. The same material is also being used to treat radioactive cooling water in the condemned nuclear powerplant in Fukushima, Japan destroyed by 2011 tsunami. Professionals and researchers are currentlyusing the HAIX material to remove and recover phosphate from various waste water sources. 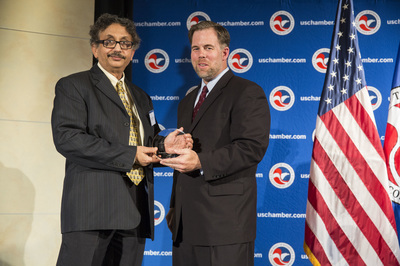 On April 20, 2015 at the US Chamber of Commerce in Washington, D.C., SenGupta was the recipient of the 2015 IP Champion Award in an event commemorating World IP Day celebrating economic growth through innovation. SenGupta is the recipient of eight US Patents. Eradicating Arsenic and Fluoride is the main objective of our work. Ensuring safe drinking to the Arsenic prone zones is what we are trying to provide people. 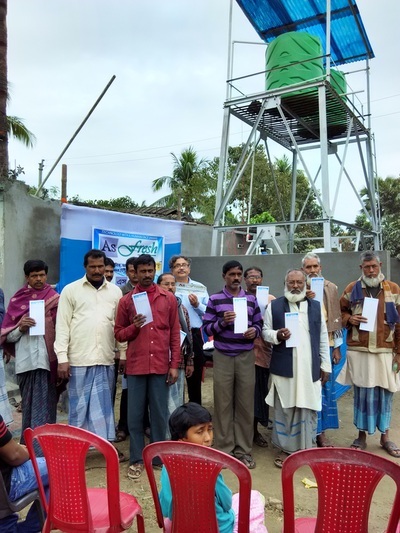 And yet again we have succeeded in giving people of Murshidabad treated Arsenic free water. 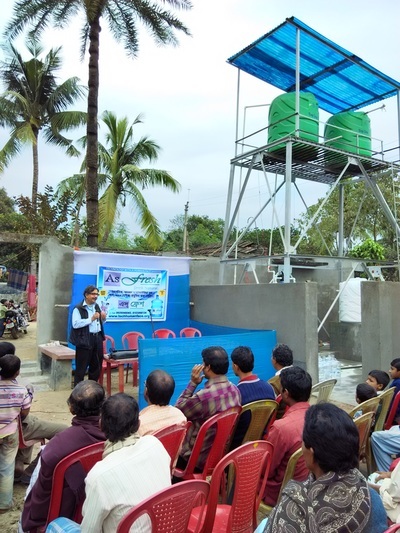 Installing the plant in Domkal, Murshidabad gave us another vibrant opportunity to help people for a better life, to live long and to keep well by drinking water "As Fresh" as ever. Technology with a Human Face (THF) wants to add freshness in the lives of people by giving "AsFresh", the quality drinking water. 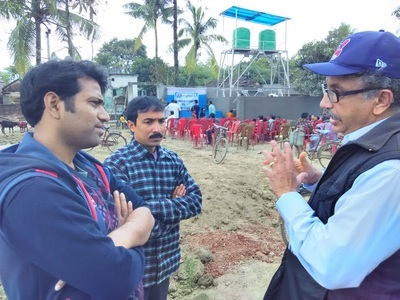 With the technologies of our founder member Dr. Arup Sengupta we have accomplished this job and the person who took all the responsibilities is Mr. Gulbadan Abbas (Entrepreneur). Hence, on February 1st 2015, we inaugurated the plant with the presence of Dr. Arup Sengupta and our President Mr. Prasun Sengupta. 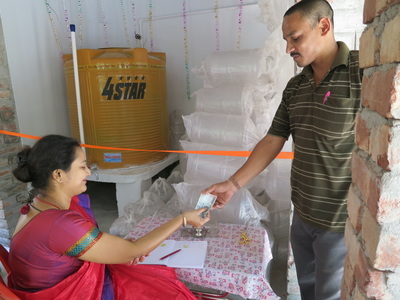 On the day of the inauguration we distributed 150+ membership cards with a 20 liter jerrycan to each. Each day we are successful in providing each family 20 liters of "AsFresh" water, that is safe and pure as per WHO standards for only 0.17 paisa per liter (Rs. 100 or $1.60 per month). This gave the chance to introduce ourselves to the villagers, knowing their problems and trying to solve them. The inaugural ceremony indeed made us happy to communicate with the sufferers and gave us an added impetus to do such works in the future, just to make people drink safe drinking water. In this manner we aspire to reach our goal of providing Arsenic free water to all and thus to desire in corroborating our organization. Read a recent Telegraph article by Dr. Arup SenGupta about the Myths & Facts around arsenic treatment strategies. Are deep tube wells safe? Do people get safe water through piped water supplies? Is arsenic treatment expensive or difficult? etc. As part of the Gangetic Plain, Nepal has many regions impacted by natural arsenic contamination of groundwater. STHF has recently gotten involved in providing HAIX treatment facilities in Nepal along with the support of Tagore-SenGupta Foundation (USA) and several other organizations. First tests confirm successful treatment. Click HERE for the test report. Mrs. Ruplekha Banerjee, holding the contract signed with THF for installing the Arsenic removal plant in 2012. 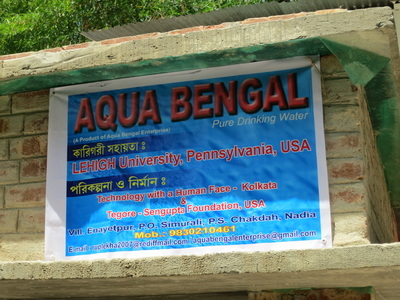 The Inauguration of Aqua Bengal Enterprise on April 15, 2013 was a great success! Water was sweet. Sales began. And all were happy. Mrs. Ruplekha Bannerjee, a housewife turned professionally successful woman. And TSF has given her the opportunity to define herself as a woman of power, thus giving every means to celebrate her womanhood. Since 2013 Mrs. Bannerjee of Simurali, an arsenic prone zone of Nadia, West Bengal runs a water treatment plant all by herself. She supplies 20ltrs. 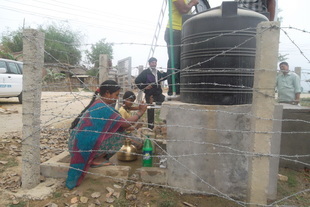 of treated water to at least 25 families each day. Her success is our pride and we feel even more accomplished as an NGO to see her managing her enterprise efficiently. She also supplies water to caterers for any occasion, to the business organizations and to family parties as well. Her accumulated income is about Rs. 30,000 per month. Arup SenGupta, recipient of many honors for his efforts to remove arsenic from drinking water, has added a major award for his more recent fight against fluoride contamination. On Nov. 15, at the Santa Clara Convention Center in California, SenGupta won a prize from TechAwards, a nonprofit organization founded by multinational corporations in Silicon Valley. The awards ceremony was attended by 1,400 people. SenGupta, the P.C. Rossin Professor of civil and environmental engineering and also of chemical engineering, won the Intel Environmental Award, one of six 2012 Tech Laureate grand prizes awarded by TechAwards. The award carries a cash prize of $75,000. TechAwards recognized SenGupta for using technology to transform a water crisis into an economic enterprise. Nearly 500 million people in Africa and Asia drink groundwater with excessive amounts of fluoride. Such contamination has been associated with dental problems, joint pain, limb deformities and other ills. Tech Awards annually honors entrepreneurs and innovators who apply technology to solve global problems. Awards are given in six categories: Education, Environment, Health, Energy, Economic Development and Young Innovators. More than 700 nominations from over 60 countries were submitted this year. 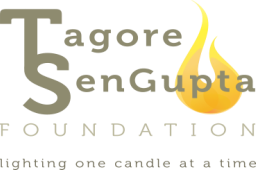 SenGupta has donated his prize money to the Tagore-SenGupta Foundation (T-S), an organization he started with his students, which supports community projects related to clean water, sanitation and education. In 2011, T-S won the 2011 Reed Elsevier Environmental Challenge, an international contest that aims to improve people’s access to safe and sustainable water. Reed Elsevier cited SenGupta and his group for their efforts to install in Cambodian villages and schools a system that removes arsenic from groundwater. Developed by SenGupta and his students over the past 16 years, the system—the world’s first reusable arsenic-selective adsorbent—is now being used in seven different countries. Through the Tagore-SenGupta Foundation, SenGupta and his students will use the TechAwards prize to conduct field tests of fluoride mitigation technology that the group developed at Lehigh. Earlier this year, with the support of a Fulbright Environmental Leadership Award, SenGupta spent six months at the Indian Institute of Science in Bangalore, India. SenGupta and Surapol Padungthon, a Ph.D. candidate in environmental engineering, have developed an adsorbent that is capable of removing both arsenic and fluoride. Vice president William C. Brehm, far right, poses for a picture with Reed Elsevier staff in Stockholm during World Water Week. The TS Foundation received the grand prize of the first annual Reed Elsevier environmental challenge. On August 24, 2011, I had the privilege of representing the T-S Foundation at the first annual Reed Elsevier Environmental Challenge award reception. 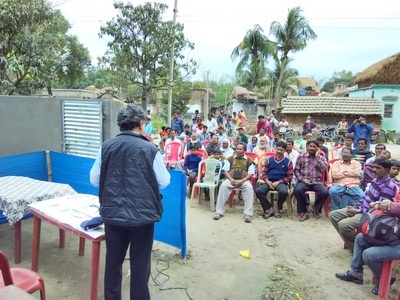 The event took place during World Water Week and was attended by over 50 people. There were academics, development workers and businesspeople in the crowd. The T-S project, which will start in January, sparked much excitement and interest by all in attendance. I spoke for about 5 minutes during the reception and then joined dinner with the Corporate Social Responsibility director, the vice-chairman of Reed Elsevier, as well as a few other guests. In 1912, after having read the poems from yet-to-be-published manuscript of Gitanjali, W.B.Yeats, the eminent Irish poet, wrote “these prose translations from Rabindranath Tagore have stirred my blood as nothing has for years.” In retrospect, that was just the beginning. Suavity and eternal appeal of these poems to humanity have since resonated with so many everywhere. Besides being a world-acclaimed poet, Rabindranath Tagore was also a philosopher, litterateur, educationist, visionary, secularist among religious divisions and a social reformer in pre-independence India. He is the composer of our National Anthem that marks its centenary this year. Mahatma Gandhi used to call Tagore “Gurudev” and said of him: “In common with thousands of his countrymen I owe much to Tagore, who by his poetic genius and singular purity of life has raised India in the estimation of the world.” A Renaissance figure, breathtaking in vigor, volume and variety, Gurudev Rabindranath Tagore was also a champion of the One World idea. Time and again, he stood up against petty nationalism and other short-sighted practices that often cloud clear thinking, raise walls of separation and create irreconcilable differences. He was the first from the East to win the Nobel Prize but his life-long contributions truly surpass any award or glory that was conferred on him. Rabindranath Tagore is by no means only for the so-called elite and academic. You carelessly throw your own power in exile. The insult you endure shall be the same. 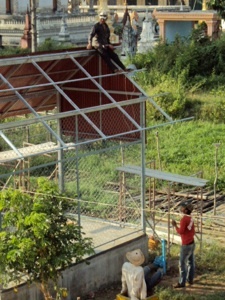 The TS Foundation won first prize in the 2011 International Reed Elsevier Environmental Challenge. 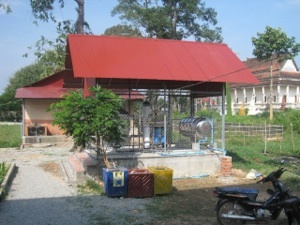 The 2012 project will install 12 arsenic water filters in rural Cambodia. Over 100 applicants from around the world applied, but it was TS member Sudipta Sarkar’s proposal that took first place. The project is an adaptation of the India arsenic filtration project. 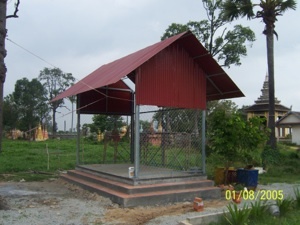 The construction of the Aranh School water filter in Cambodia is complete. Already community members are coming into use the filter. Now we will work with the village chief and principal to organize the community around the water filter by forming a water council to manage the system and then try to incorporate the filter into the chemistry classes in the 7th grade! 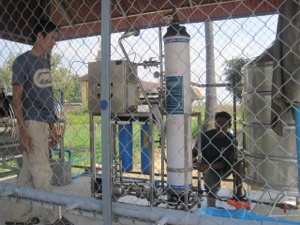 A company called ITT donated a UF filter to Caring for Cambodia (CFC) earlier this year. It was part of ITT's corporate responsibility, but unfortunately they only provided the filter—not the money to actually install the system. CFC has stored the filter in its storage unit since it was delivered because they didn't have the money to install it. But CFC wants to install the system in one of its schools (Aranh) because of this years increased student population. The Aranh school will open a 7th grade for the first time this October, adding 180 students to the school, and stress to the one Asia Water Foundation water system currently in place. 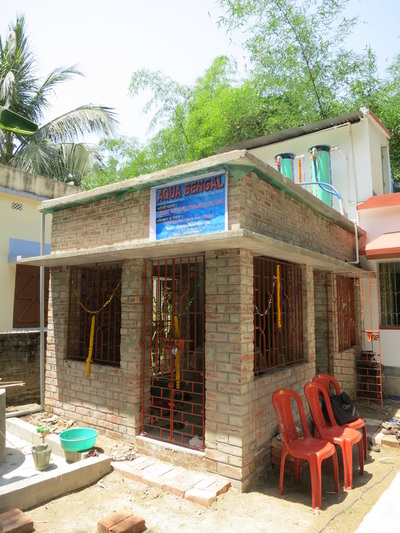 The Tagore-SenGupta Foundation has provided the needed funding to CFC to install this system. 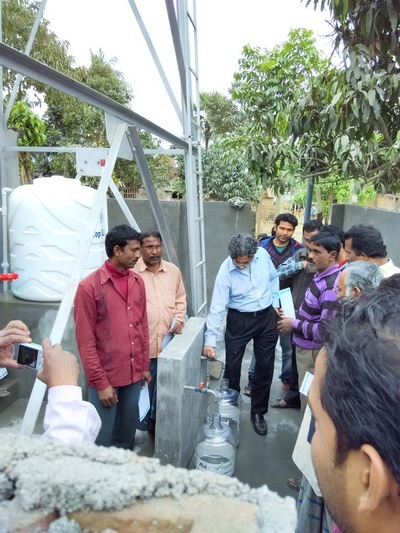 More importantly, at the request of the TS Foundation, CFC will use a community water model similar to the arsenic water removal system in India. With this approach, the water system will be installed, giving 180 more students access to clean water and will connect the community with the school through the water system. Currently CFC's water systems are open to the public without organizing the community around the systems. It is good that more people have access to clean water, but the community is completely dependent on CFC to maintain and upkeep the well. As the TS Foundation knows, dependency is not development. The country director of CFC loved the idea of a community system. He has already spoken with the commune chief. The chief will soon call a meeting of the village to persuade families to participate in the community water system later this month. The idea is simple: a small tariff will be collected from each family in return to unlimited access to clean water; the village will hire a villager to run and maintain the system on the school's ground; and the money will be controlled by an elected water council. Hopefully some entrepreneurial villagers will figure out more ways to make money using this system. 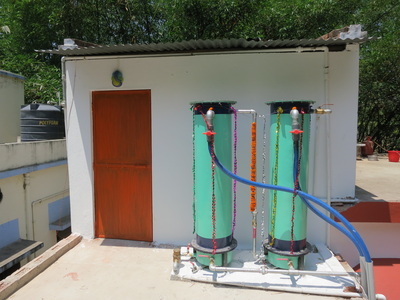 This model connects school and community through a water filter. Wealth is generated by hiring a local employee and giving financial independence to the water council. The tariff collected will not be used by CFC in any way. Additionally, since the system is on school grounds, the filter itself will be a direct link to both primary and secondary education. 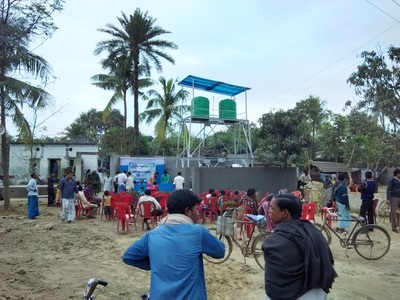 On the primary level, this system will provide information about clean water habits and hygiene to the young students. For students in the 7th grade, experiments connected to the water filter—and potentially water wells around the community—will contribute to both "life skills" and the science curriculum. This system will connect many dots, and will meet the mission of CFC and the TS foundation. 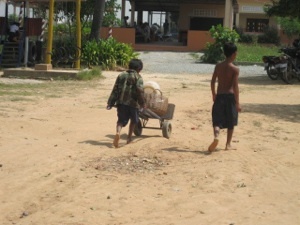 The Caring for Cambodia sponsored Aranh School is expanding to lower secondary school. With more students comes an increase demand for clean water. The TS Foundation is using this opportunity to introduce a community water model at the school. 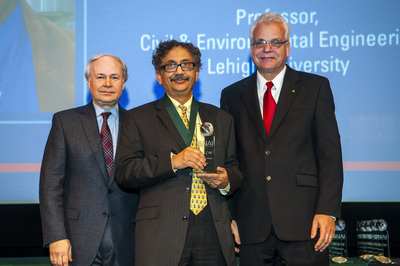 Arup K. SenGupta is P. C. Rossin Professor and Chairperson of Department of Civil & Environmental Engineering at Lehigh University.